This delightful tale is about a particularly talented baker, Miriam, whose tantalizing smells attract Sebaastian, a musician. This couple falls in love and marries, and then have an adorable little baby. But life with the new baby isn't quite as easy as it had been. When the baby won't stop crying, Miriam does what she does best, and that is what gives the baby comfort. This old-fashioned story has a timeless feel. It's like a mid-century musical come to life. 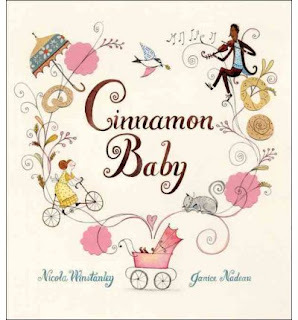 Nadeau's adorable illustrations are detailed but unified so they never become overwhelming. My kids were really happy to see that the mom and dad are different colours, and the baby reflects both parents' features. Mixed-race kids are rare in kids' literature, and books like this and Spork are great favourites in our mixed-race household. Children like to see their own situations reflected in books, the same way adults do. Some illustrators have a secret mark or animal that they hide on every page, and in this book at least, Nadeau's is a curlicue. So much fun finding these hidden in other objects! This is the fifteenth book I have reviewed for the Sixth Canadian Book Challenge. This looks gorgeous!!!!! And whimsical. I love the sound of it too.